Benadryl is an antihistamine with the active ingredient diphenhydramine. It can provide your dog temporary relief for allergic reactions caused by bee stings, insect bites, vaccinations, snake bites and can provide relief if your dog is itching because of a flea allergy or food allergy. If you give your dog Benadryl for itching associated with a food allergy, it will only treat the symptoms for a short time. You will still need to take your dog to a veterinarian for a definitive diagnosis and treatment. 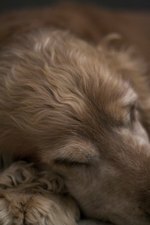 Select the type of Benadryl you will give your dog. The type of Benadryl you select for your dog should be in capsule or tablet form, as the liquid forms contain too much alcohol to be used safely for animals. Check to ensure that the only active ingredient in the product is diphenhydramine. Weigh your dog. Your dog will take 1 mg to 2 mg of Benadryl per lb. of body weight. This means, for example, that if your dog weighs 25 pounds, the pet can have 25 mg to 50 mg of Benadryl. Roll the Benadryl pill in peanut butter. Offer the peanut butter-coated Benadryl to your dog, as you would a treat. Give your dog Benadryl again in eight hours, if symptoms persist or return.